Kerm, nooooooo! A typo in the grey! "...learn to code and to think like a programming with..." Make it "...learn to code and think like a programmer with..."! The two "to"s are a bit redundant, you only need one (parallelism!). Other than that, I'd suggest a tad bit of humor to attract more people, but it looks great! Trying to bring this back to life for hopefully getting this into a finalized form. So I think I still need to cut down some of those extremely verbose bullet points. I think it's okay if we leave the books on (of course I'm biased! ), since I consider them a Cemetech resource in some form. I'll fix the Tools page; thanks for finding out that it was broken! I completely missed this - would you guys have any issues if I were to print one out and post it at the library I work at? We've got a board anyone can post on here, provided its sensible, and since we have a great many math tutors and college students here, I feel it would be fairly helpful. No, that's the idea! We just need to make sure we perfect it to get our message across clearly and succinctly before we impose upon people to post it, I think. Feel free to take a shot at making those bullet points more concise and post what you come up with in this topic, and that might help to inspire me in the direction we're trying to go with this. No guarantees that I'll use your words verbatim, of course. No guarantees that I'll use your words verbatim, of course. Not my point for doing this Sir. It's your project! Anyway, I was working on this for like 2 hours or something and I decided to tackle it at a different angle. What I mean by that is, instead of going at it with the perspective "what do we want to put on this for people to see?" I went with the perspective of "what do people want to see?" Of course, "people" refers to mainly math/programming/electronics people and those who want to start learning. I tried to look at what was posted before as if I was like I was when I first came here, basically an outsider. I did feel like what you were pushing in the previous posts was all about students and teachers. What if someone was neither? Having "for students" and "for teachers" as headings, at least in my opinion, makes it seem like that's where we are geared towards. Now I'm sure that's definitely not the case since I wasn't a programming student (I wasn't taking my college math class yet) and yet I'm here (whether you regret that or not is up to you). So I decided to omit those headings, and when going over the points for said headings, they seemed really redundant when I got down to brass tax. What I have now (listed below) is just a description paragraph, a list of a few features here, and a plug to the website. Using the exact text I wrote in size 14 font, there's enough room on the page to put the big logo at the top and to plug the kermbooks at the bottom. So, yeah, that's all my ideas. 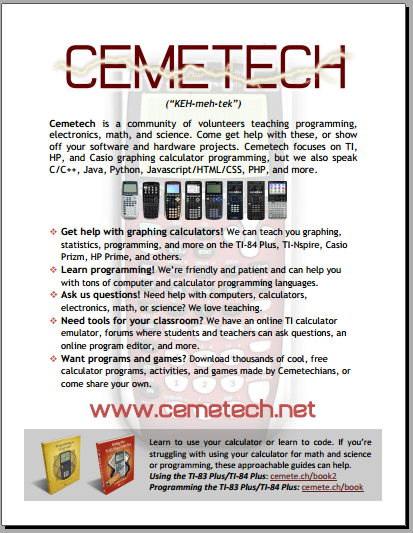 Cemetech is a programming community of volunteers teaching math, programming, and electronics. The main programming focus is based on the languages on graphing calculators made by Texas Instruments, HP, and Casio; but there are also informative topics on computer programming languages like Java, Python, C, and more. 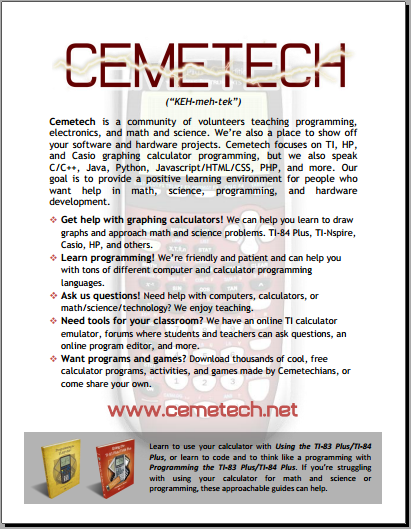 The main goal of Cemetech is to provide a positive learning environment for those who need help in math, programming, and hardware development. We have very useful tips and tricks for everyone with either a graphing calculator, a computer, or both! -Learn programming! Our volunteers are clear and understanding and can help with almost every language; calculator and computer. -Ask us questions! Don't ask if anyone's here, or if anyone's alive, or to ask a question. Just ask! We can help with everything from math problems to why a program doesn't work. -Want to learn programming without risking ruining your graphing calculator? Or are you a teacher wanting to easily show you students how to use a graphing calculator? No sweat! We have an emulator ready for you to use. We will even help you retrieve the ROM needed to run it! Not to get off topic, but I think he actually meant "persuasive". Thanks to Chauronlilsis's suggestions, I made some simplifications and modifications to the flier. I also noticed I didn't fix "programming" to "programmer" in the box at the bottom yet; whoops. Other than that, comments? That looks pretty solid! Nice work Chauronslilsis! One thing that might sound a little better is to combine the first point into one sentence with an "on the", or make the second fragment a sentence. Other than that, I like it! First sentence has too many ands in it, I think. I agree with Mateo on the first bullet point.. Otherwise, I think it looks good. Thank you for the feedback guys. I've done even more work simplifying this; what do you think? Very nice sir I like the addition of the little calcs under the beginning paragraph. Makes it more eye-catching. - Ask us questions! We can answer your questions about computers, calculators, electronics, math, science, and more. Edit: With this change, I've handed the flier back over to tifreak, so his time and busy life permitting, we'll hopefully see a news article about it eventually, and I hope everyone will join us in posting a few copies on school and library bulletin boards. © Copyright 2000-2019 Cemetech & Christopher Mitchell :: Page Execution Time: 0.159455 seconds.